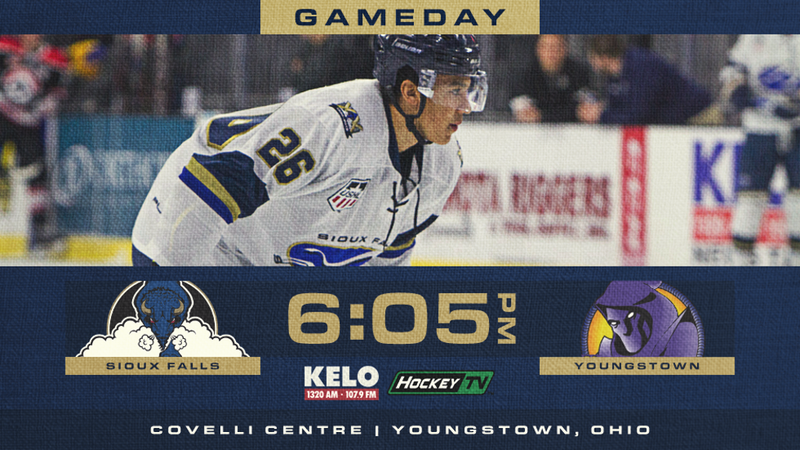 TONIGHT’S GAME: The Stampede close out a weekend series against the Youngstown Phantoms at the Covelli Center. The Stampede took the opener last night by a score of 4-1. LAST NIGHT: Youngstown scored the first goal of the game less than four minutes in, but the Stampede outshot the Phantoms 13-3 in the first and eventually tied the game late in the period on a goal from Jared Westcott. Carl Berglund scored in the second to give the Herd their first lead of the game and then extended it with a goal just 29 seconds into the third period to take a 3-1 lead. Alec Calvaruso made some big saves during the period to keep the Phantoms off the board and Blake Bride sealed the game with an empty net goal late in the game. Calvaruso stopped 18 of 19 shots in goal on the night to improve to 19-5-3 on the year. STAMPEDE UPDATE: The win last night coupled with Chicago’s 3-1 win in Waterloo last night has the Stampede in sole possession of second place with three games remaining on the season with 81 points. The first tie breaker for playoffs (should both team end the season with the same number of points) is regulation and overtime wins which Waterloo leads 35 to 34 over the Stampede. The second tiebreaker is head-to-head which the Stampede would win. The top two teams from each conference receive first round byes while the third and fourth place seeds will host a best-of-three first round series against the fifth ands sixth place seeds. The playoffs begin the week of April 15th. Waterloo hosts Omaha tonight and ends the regular season with a home-and-home series with Dubuque next weekend. PHANTOMS UPDATE: Much like the Stampede, the Phantoms are in the thick in a race for second place over in the Eastern Conference. They enter tonight with 71 points and three points back of Chicago for second place and a first-round bye with four games remaining on the schedule. The Phantoms have been hot off late, going 13-3-1 in their last 17 games entering tonight. Youngstown enters tonight tied with Cedar Rapids for third and hold a three-point lead over Team USA for home ice advantage in the first round of the playoffs. After tonight, the Phantoms will close out the regular season next weekend with a two-game set against Team USA. UP NEXT: The Herd return home next weekend for the final regular season homestand of the season. Friday, April 12th is Fan Appreciation Night, presented by Signature Companies and Saturday, April 13th is Take My Jersey Night, presented by Waterbury Heating & Cooling and Coleman Heating & Air Conditioning. Tickets are on sale now through the KELOLAND Box Office or any Ticketmaster outlet.